Harmony Creek Golf Centre is committed to excellence in serving all customers including people with disabilities and guests. Upon request, we will make a reasonable effort to accommodate the needs of any customer. If the customer’s needs cannot be accommodated we will ask how we can better serve them in the future. If a customer doesn’t have a screen reader or can’t access our website for information they can call the facility and obtain information over the phone. There are up to 3 managers and a minimum of 2 employees during the regular season that can assist with all customer inquiries. An accessible washroom is located on the main level of the building close to the restaurant/bar and banquet hall. An elevator with bell is located on the ground level and management/staff is readily available to assist any patrons who need accessibility to the main level. We will ensure that our staff are trained and familiar with various assistive devices we have on site or that we provide that may be used by customers with disabilities while accessing our goods and services. All assistive devices are allowed on premises. The management and/or its employees will assist customers with access to the building and/or on the premises. Parking spaces identified by wheelchair symbols are located on the west side upon entering the parking lot and on the northwest side of the clubhouse just outside the pro shop. Spaces are readily available. We welcome people with disabilities and their service animals. Service animals are allowed on the parts of our premises that are open to the public except in the kitchen. i. If attending to dine in the facility off the menu or a la carte, then, all persons must pay full price for goods and services unless special rates are arranged with on-site coordinators. ii. If attending as guests to a function in the clubhouse, the host of the function is usually responsible for the payment terms of its guests. *We will notify customers of any fees pertaining to Golf, Driving Range, Mini Putt and related Golf Services through notices posted on the website or in the Pro Shop. *All fees pertaining to Restaurant and Bar Services are disclosed in Menus in the Lounge and Function Pricing is posted on the website or are available as packages in the Catering Office. Copies of menus and prices are always available for distribution. Please contact the on-site coordinator or staff. Harmony Creek Golf Centre will provide training to employees, volunteers and others who deal with the public or other third parties on our behalf. Training will also be provided to people involved in the development of policies, plans, practices and procedures related to the provision of our goods and services. This training will be provided to staff within 2 weeks of the hiring date. All feedback, including complaints, will be reviewed and responded to. 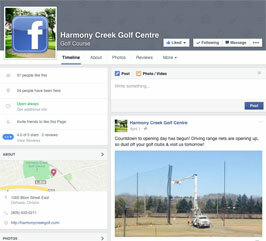 The Harmony Creek Golf Centre will notify the public that our policies are available upon request by putting the information online and having it available in the Pro Shop. Any policy of Harmony Creek Golf Centre that does not respect and promote the dignity and independence of people with disabilities will be modified or removed.